Over 2,000 years ago today, Gaius Julius Caesar Octavius was given the title of Augustus by the Roman Senate, an event that founded the Roman Empire. Discovering this fact made me wonder "What have the Romans ever done for us?" Aside from creating the aqueduct, sanitation, roads, irrigation, medicine, education, wine, public baths, and public safety, the Romans were also huge proponents of their own language, Latin. It occurred to me that in the two years we've been doing this blog, we've never given Latin its own language profile despite having done over a hundred of them. The wait is over: we're finally getting around to covering the world's most popular "dead" language in a series of posts, starting today with a look at Old Latin. examples of Latin in the world. The earliest form of Latin is now known as Old Latin, which predates the Roman Empire. It was used from the time of the Roman Kingdom (753 BC-509 BC) until the latter years of the Roman Republic (509 BC-27 BC). You may find it surprising that Old Latin didn't use the language's namesake alphabet. 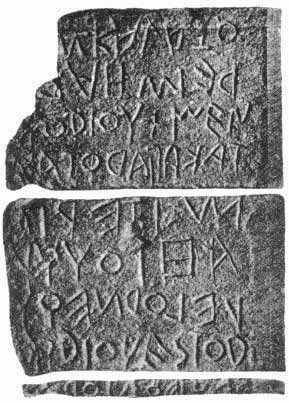 In fact, it was written using the Etruscan alphabet, which had evolved from the Greek alphabet around 700 BC. The location of this evolution is unknown, but is suggested to have taken place in Greek colonies in Italy, the city of Cumae, Greece, or in Anatolia (the geographical area which makes up most of modern-day Turkey). Since the language was "borrowing" the Etruscan alphabet for its own purposes, Old Latin only made use of 22 of the 27 characters present in the writing system. It is possible that Old Latin took these characters directly from the Archaic Etruscan alphabet, or else possibly from the Euboean alphabet, a variant of the Greek alphabet considered to be the precursor of both the Etruscan and Latin alphabets. We'll be back after the weekend, when we'll be looking at arguably the most popular and well-known form of Latin, Classical Latin. We'll see you then!